Located west of Lake Turkana, Lodwar is the capital and by far the biggest settlement of Turkana County and stretches both sides of Turkwell River.The region contains one of the most exciting and compete findings of evolution in the world, thus giving rise to the name 'The Cradle of Man'. Discovery of fossils, both flora and fauna that date back to over 27 million years have made the area a very important paleontology site.In 2007, Richard Leakey, Kenya's famous archeologist established the Turkana Basin Institute, a research facility that focuses on human prehistory and fossil excavation. 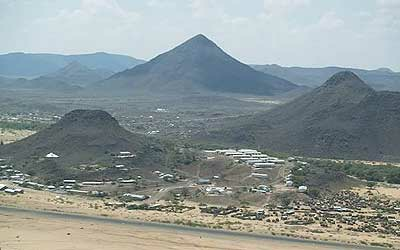 Lodwar is located near Lake Turkana which is both, the world's largest permanent desert lake and alkaline lake. Attractions in the area include: L.Turkana, Eliye Springs, Kalokol, Ferguson Bay, Central Island National Park, Namorutunga Standing Stones, Lobolo swamps, Nariokotome, Mlangoni Gorge, Lokitaung, Turkell River.